Hairpiece Styling and Selection. Men’s Hairpiece Styles. You may click on a category of Custom Hair Systems, below, to jump to that section. HAIR STYLES & DIRECTIONS | Place Your Order Now! 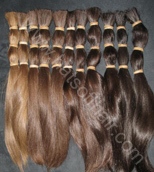 High quality processed Indian hair is an excellent match for Caucasian hair. It is processed to be tangle-free and can be re-colored easily. It has excellent shine, fine texture and moves just like your natural hair. Genuine Indian Remy hair (beware of false claims!) has not had its outer layer (cuticle) stripped away. It is harvested in ponytail bundles with the roots all at the same end to avoid tangling. Remy hair is stronger and retains its color longer than processed hair and is an excellent choice for long hair. As with the processed Indian hair, Remy Indian hair is an excellent match for Caucasian hair. Processed Chinese hair is the best choice for clients who want a very tight curl. Chinese hair is more robust than Indian hair, so it stands up better to the extreme perming required to create a tight curl. If you are of Asian descent or want perfectly straight hair, Chinese hair is your best option. Genuine Chinese Remy hair (beware of false claims!) has not had its outer layer (cuticle) stripped away. It is harvested in ponytail bundles with the roots all at the same end to avoid tangling. Remy hair is stronger and retains its color longer than processed hair and is an excellent choice for long hair. As with the processed Chinese hair, Chinese Remy hair is an excellent option for both tight curls and perfectly straight hair. Our Virgin European hair is the absolute ultimate in hair quality. No other hair type blends as naturally with your own hair color. We buy our own European hair directly from Europe - we do not deal with brokers. The hair is hand-matched and blended to match your color perfectly. Virgin European hair will look better and healthier for a longer period of time than any other type of human hair. For most clients, it also lasts much longer. Virgin European hair is expensive, but it is a worthwhile investment in your appearance. NOTE: Beware of any company that offers inexpensive "European hair" - there is no such thing! In most cases, it is Chinese hair that has been highly processed and stripped to match the fine texture of European hair. It may look good when new, but it won't take long for it to lose its shine, become brittle and break off. Our new synthetic hair is more heat-resistant and natural-looking than other synthetic hair types. Synthetic hair is a practical choice if you are out in the sun a lot because it cannot be bleached by the sun as human hair can. Our human gray hair looks and feels terrific. The only drawback to human gray hair is that it cannot be re-colored. Synthetic gray is often the most practical choice because when it is time to re-color your hair, the gray will not darken because it will not absorb the hair dye. Hair Samples: Clip one good-sized hair sample from the back of your head and another from over your ear, tape them to a white sheet of paper, note where each sample was taken from and mail it to us. If you know your hair color number, note it on your order form. Hair samples are not necessary. If you don't know your color number, you can find out by renting a color selector ring for $40 (plus shipping). We will refund the full rental charge when you return the ring or we will apply the $40 charge to your hair order. We will keep your color information on file for future use. Regardless of whether you send in samples of your own hair or use our color ring to select your "color number", we can match any hair color from black to red to blond and every shade in between. We can also blend colors and provide highlights and lowlights if desired. Hair system factories do everything in their power to reduce their overhead and increase production speed. One common shortcut is to tie two or three strands of hair into each knot instead of one. When this method is used at the hairline, the knots are very visible and each hair in each knot points in a different direction, creating an uneven and messy appearance. Our factory creates your natural looking hairline by knotting only one single hair into your base at a time. It's a bit more expensive and time-consuming, but we believe providing you with a beautiful, natural-looking hairline is worth the extra effort.